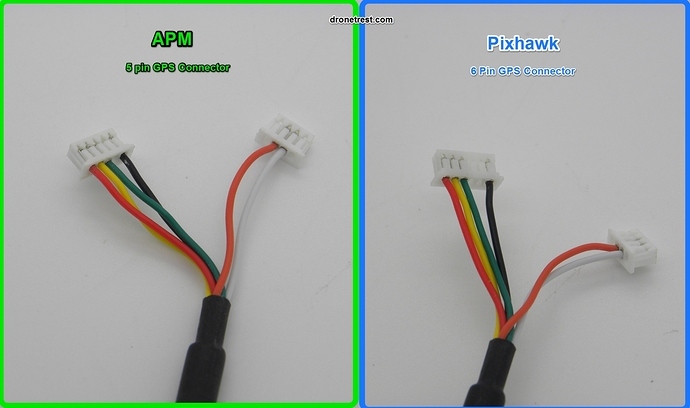 The Neo 7N GPS/Compass module that we sell come with a 6 pin connector that connects directly to your Pixhawk Autopilot. However some of you might prefer to use this GPS/Compass module with your APM board as the Neo 7N has better performance when compared to the Ublox 6 series modules. To do this, we have included a 5 pin connector for APM boards, but you will need to swap the connectors. The image below shows the two connectors with the left one being for APM, and the right for pixhawk. Please be careful when doing this as if you break the cables, or connect them the wrong way you can damage your GPS/Compass module. When swapping the connectors use some tweasers, or a small screwdriver to bend the plastic clasp upwards slightly and pull out the wire carefully. Don’t use too much force as you could cause the wire to break out of the clamp. Once removed make sure to match the colours with the connectors as shown in the image above. Also make sure the connector is the correct way around with the plastic clasps pointing upwards as shown. And lastly double check everything is correct before plugging it into your APM/Pixhawk board. The deal is pretty much the same with the NEO-M8N GPS module except that the connector that may already be attached to the cable is the 5 pin connector for APM. You swap the connectors around in exactly the same way however. How do I swap the molex connectors? Also here is a great video showing you how to swap the connector wires in case you are still not sure on how to do it. If you have any problems just comment below and I should be able to help.